"Have you ever noticed that there is a Christmas card hidden in a deck?" Says the performer and picks up a card. The card has an illustration of a Christmas wreath on its front. Then the performer starts to list random things which reminds us of Christmas. When he comes to the end of the list he says "a Christmas cake", and you find a Christmas cake has appeared on the card he had picked in the beginning. 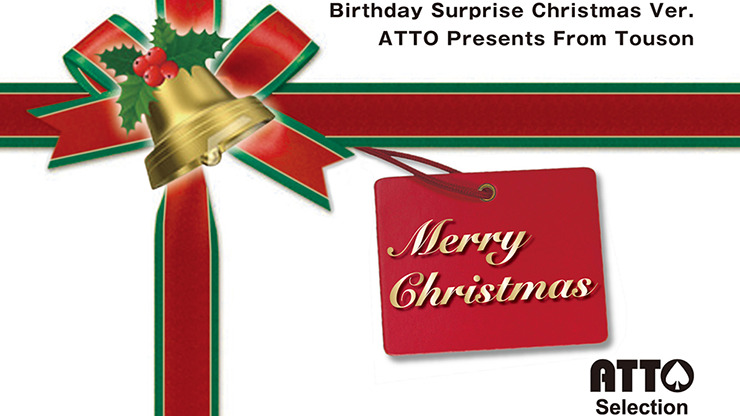 This is a Christmas-featured gaff card which uses the same theory as Birthday Surprise. Anyone can enjoy this very Christmas-like card magic easily, and even add their own original and fancy routine. This magic can also work as a great way to give a greeting card. You can write a message on the side with the pop-up Christmas cake, and it will become a memorable Christmas gift.